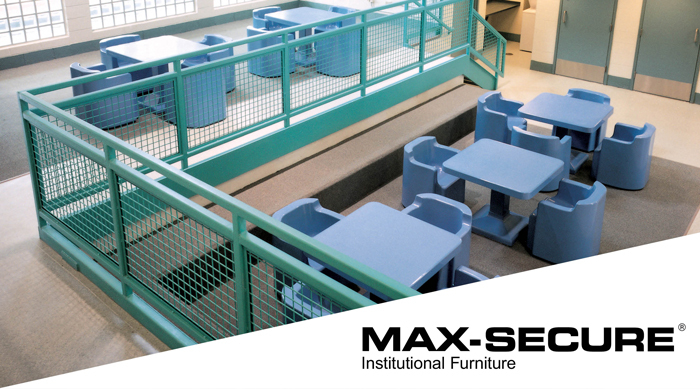 Max-Secure® Security systems is proud to be providing correctional facilities with secure, safe, attractive, and easy to install furniture for over thirty years. Having installed over more than 25,000 components from coast to coast we pride ourselves on a ‘no fail’ record in state or federal correctional facilities as well as psychiatric hospitals. Being a world leader in design and installation of institutional furniture, we guarantee complete customer satisfaction. Our wide variety of products has become the industries standard for fire code and building compliance. The use of our unique material, Herculite, a durable proprietary plastic composite allows our products to be not only non flammable, but impossible to scratch or carve. This makes our units safe additions to county, state, or federal facilities. Fortunately, our products are also cost effective. Max-Secure® resident room institutional furniture. Max-Secure® dining or day room furniture. Max-Secure® advanced security wall systems.